When individuals with I/DD abuse substances, it’s often a hidden problem compounded by a lack of recognition and inadequate treatment options, but social workers are exploring solutions. Treatment disparities between individuals with intellectual and developmental disabilities (I/DD) and those without them begins with underrecognition of the problem by those affected as well as by social workers and other care providers. People with I/DD often do not find their way into treatment either because they are not recognized as likely to use or abuse substances or because the manifestations of use and abuse are camouflaged by their intellectual or developmental limitations. There’s a common misperception that clients with I/DD don’t drink or use drugs, says Susan Tatum, LCSW, assistant director of clinical and emergency services at the Alexandria Department of Community and Human Services in Virginia. They may experience problems resulting from substance abuse, she says, but substance use may not be suspected as the source of the problems. Second, she explains, is the infantilization of people with I/DD. “If we do not see people with I/DD as adolescents and adults capable of emotions and behaviors common to anyone, we risk missing obvious signs of an altered state,” she notes. Clinicians need to be aware that “in all the ways that clients with I/DD are more vulnerable for any reason, they can be vulnerable to substance use,” Tatum says. While people with I/DD do not appear to abuse substances at a rate as high as those without I/DD, they’re not immune and may be increasingly vulnerable. About 25% of those with I/DD are believed to use substances, but Quintero says the lack of research makes it difficult to ascertain the true number, and the risk may be rising as a result of social change. People with I/DD have had a high level of abstinence, possibly due in part to the amount of supervision they usually have in their lives, she says. But, in many cases, that supervision is diminishing or absent. In a recent webinar on alcohol and drug use in individuals with I/DD, Genevieve Grady, PhD, an addictions and mental health specialist, noted that there is a growing number who may not have experienced as much institutionalization or insulation from the community. 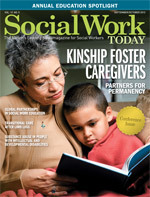 Writing in Health and Social Work, Elspeth M. Slayter, PhD, MSW, an assistant professor in the School of Social Work at Salem State University in Massachusetts, points to research indicating that the deinstitutionalization movement resulted in greater community participation in people with I/DD—a freedom, she says, that “has also facilitated access to alcohol and other drugs and, thus, the potential for developing substance abuse disorders” (2010). Experts agree that in addition to males, youths, and individuals with the mildest levels of impairment, those who live independently and have co-occurring mental disorders have a special risk (Taggart, McLaughlin, Quinn, & Milligan, 2006). A family history of abuse, particularly on the part of a father, increases the risk. Individuals with I/DD who live in the community often become involved with drug or alcohol use for the same reasons and in the same ways as do others: wanting to fit in or to combat stress (Grady, 2013). “Drinking is a social activity that can help a person feel like part of the crowd. That social function is strong in people with I/DD,” Quintero says. Disabilities may contribute additional motivations to drink and cloud people’s ability to apply good judgment surrounding social drinking. Clients with I/DD may have fewer resources, such as fewer people to talk to about their feelings or help them tolerate distress, so they may find comfort in substance use, Tatum suggests. The social stigma of having a disability also contributes to risk. While their motivations may parallel those of other substance abusers, patterns of abuse and their consequences are apt to be different. Most people with I/DD tend to experiment with drinking later in life than do their counterparts without I/DD, Quintero says, explaining that while others typically begin to sample alcohol in their teen years, people with I/DD usually begin in their early adult years. While people with intellectual disabilities are less likely than others to use substances, those who do are not only more likely to abuse them but also to experience more negative consequences as a result (Grady, 2013). There are numerous ways in which the repercussions of substance use are magnified in this population, according to Grady. Substance users in the I/DD population already may have decreased attention spans, lower reaction times, are excessively compliant, and have reduced cognitive functioning, so the effect of drugs or alcohol on their brains is more pronounced. They’re less able, for example, to secure a safe ride home, know when to stop drinking, and recognize the danger to their well-being. As a result, they may need addiction treatment earlier than non-I/DD users or abusers (Grady, 2013). Despite a clear need for treatment, individuals often fall through the cracks due in part to their inability to recognize the dangers associated with their behaviors. If they try alcohol or drugs and enjoy them, they’re likely to continue to use them and don’t always link cause and effect when problems occur, Tatum explains. When clients have more supervision, Quintero says caregivers may prompt them to seek help and direct them to sources of support. But the more clients with I/DD live independently, the more that safety net disappears. Lack of recognition is only one aspect of the disparity in treatment access for individuals with I/DD. Even when clients or their caregivers recognize the need for treatment, research is lacking about their particular experience of substance use and abuse, adequate treatment options may be difficult to find, and there may be limited access to existing programs. This population generally is not adequately treated, Quintero acknowledges. “We need more hard data on treatment methods for people with I/DD. There just isn’t enough to say what works and what doesn’t,” she says. People with disabilities should be included in research and data statistics, notes Laura Yager, LPC, CPP-ATOD, director of partnerships and resource development for Fairfax-Falls Church Community Services Board in Virginia. Evidence of the lack of scholarly attention and training is apparent in the community where there may be no expert resource that social workers and others can turn to for support or services. Add that to a lack of recognition and subsequent referral to existing support sources, and a vicious cycle emerges. “We’ve never had more than one or two individuals at a time who had co-occurring I/DD and substance abuse,” says Joanna Wise Barnes, bureau chief of I/DD services at Arlington County Department of Human Services in Virginia. Nonetheless, her efforts to address the disparity came up short. Even within a community dedicated to caring for individuals with intellectual disabilities, she couldn’t find even one person with professional expertise in treating individuals with a dual diagnosis of substance abuse and I/DD. One way in which existing services fail to help is that the health promotion materials they rely on are not targeted to the needs and abilities of individuals with intellectual disabilities, Yager says. Materials, including those related to substance abuse, she says, “may be written at too high a reading level for a person with an intellectual disability.” These clients “need access to substance abuse education and prevention materials that are culturally sensitive, linguistically accessible, and inclusive in order to meet their needs,” she says. A case in point is the traditionally successful AA type program, according to Quintero. A care provider who wishes to support an I/DD client through referral to such a program will have difficulty finding one that “welcomes people with I/DD and has materials and cohorts at the appropriate cognitive level to create a genuine community of support,” she says. Yager says reading or writing assignments, for example, can be adapted to verbal discussions when literacy is an issue and, when clients with I/DD are part of group treatment settings, providing education to other group members about these disabilities and how they can be supportive group members can be useful. Some treatment concepts, such as those used in 12-step programs, are likely to prove too challenging for individuals with intellectual difficulties. However, it’s possible to adapt abstract concepts such as spirituality and the notion of a higher power to more concrete concepts such as empowerment and self-efficacy, she says. Grady, G. (2013). Drug, alcohol & abuse; co-occurring disorder in individuals w/ intellectual/develop disabilities. Retrieved February 22, 2013, from http://oregonddcoalition.org/index.php/oddc/train/train_event/232. Slayter, E. M. (2010). Disparities in access to substance abuse treatment among people with intellectual disabilities and serious mental illness, Health and Social Work, 35(1), 49-59. Taggart, L., McLaughlin, D., Quinn, B., & Milligan, V. (2006). An exploration of substance misuse in people with intellectual disabilities. J Intellect Disabil Res, 50(Pt 8), 588-597.